Analysis of Turbulent Flows is written by one of the most prolific authors in the field of CFD. Professor of Aerodynamics at SUPAERO and Director of DMAE at ONERA, Professor Tuncer Cebeci calls on both his academic and industrial experience when presenting this work. Each chapter has been specifically constructed to provide a comprehensive overview of turbulent flow and its measurement. 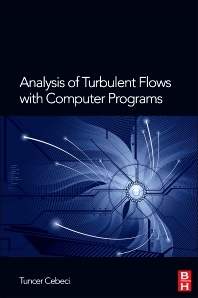 Analysis of Turbulent Flows serves as an advanced textbook for PhD candidates working in the field of CFD and is essential reading for researchers, practitioners in industry and MSc and MEng students. The field of CFD is strongly represented by the following corporate organizations: Boeing, Airbus, Thales, United Technologies and General Electric. Government bodies and academic institutions also have a strong interest in this exciting field. Mechanical Engineers, Process Engineers, Aerospace and Automotive Engineers. Combustion and fluid flow specialists. Chair of the Department of Aerospace Engineering, California State University, Professor Cebeci is widely regarded as an expert in the field of Turbulent Flows and has received many accolades for his work. He was named the first Distinguished Professor in the California State University System, and he received numerous awards including Fellow of the American Institute of Aeronautics and Astronautics. He also received the Presidential Science Award from Turkey.